Salvage Operations | UrbanOre.com - Urban Ore has had workers salvaging at the Berkeley Transfer Station since our beginning in 1979. 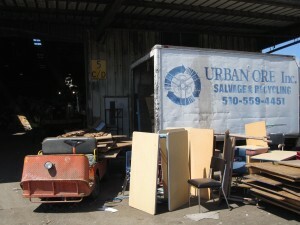 Urban Ore salvages two to six tons per day from the Berkeley Transfer Station. Trees are given yet another life due to the effort of our salvagers at the city dump. These desks and plywood were part of a nearly 10 ton diversion from the landfill done by just three salvagers. All in a day's work! Urban Ore has had workers salvaging at the tipping area since our beginning in 1979. This is a contracted service, and for 27 of the 30 years we have salvaged actively, our contract has been with the City of Berkeley. Our contract is reviewed and revised periodically, and covers such essentials as hours of operation, insurance, supervisory authority, and the like. The current contract was renewed in 2008. Tonnage from this source ranges from two to six tons per day. The photo on the right comes from a day where over nine tons were salvaged in one day. Our large sales yard and streamlined receiving procedures allow us to absorb this large supply and still accept dozens of loads daily from supply customers who wish to save on dumping costs. The Salvage and Recycling crew accepts many unreusable items for recycling, usually after cleaning and dismantling. These materials require substantial skilled labor to prepare them for commodity markets that may or may not pay. Buyers on the receiving crew may charge a fee for receiving some of these items. Lights, Christmas Lights, Fluorescent fixtures – we accept them free of charge if their ballasts are removed and brought in separately. Ballasts can be removed safely and quickly with a screwdriver. Put them in boxes or buckets.